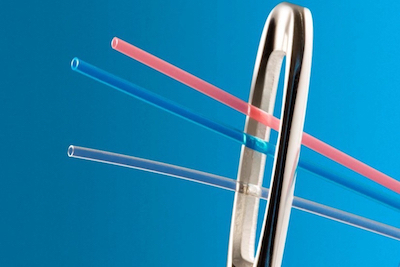 Medical tubing supplier Natvar (City of Industry, CA), a Tekni-Plex company, has introduced a new tight-tolerance micro-extrusion product line made from thermoplastics and other engineered materials. Micro-extruded tubing is in demand for a variety of neurovascular and surgical applications. Natvar micro-extruded medical tubingMore expensive materials such as glass and fluoropolymers historically have been used to produce micro-extrusion tubing because of their ability to consistently hold tolerances, a key requirement for downsizing medical devices. “Natvar’s considerable investment in state-of-the-art manufacturing enables us to micro-extrude monolayer, co-extruded, multi-lumen tubing or profiles in a variety of thermoplastic materials at CPK 1 values above 2.0,” said Bob Donohue, General Manager. The CPK value indicates how close a process is running to its specification limits, relative to the natural variability of the process, explained Natvar. As a frame of reference, a CPK of 1.33 or better is what medical device companies typically require. “The ability to run thermoplastics means that medical device companies can realize desired performance attributes at a fraction of the cost associated with fluoropolymers and glass,” added Donohue. Natvar’s new micro-extrusion tubing comes in wall thicknesses ranging from 0.003 to 0.005 inches. It can be co-extruded in up to four layers. The manufacturing line also can run fluoropolymers to deliver specific attributes or in instances when the company wants to avoid validating costs associated with a different material. Natvar is among several hundred exhibitors at the co-located PLASTEC East and MD&M East event in New York City in June. Go to the PLASTEC East website to learn more about the event and to register to attend. “We already have produced micro-extrusion tubing within a short development lead time. We have been successful in getting products right in the first pass, eliminating the need to create multiple generations. This capability is an added bonus for those with tight speed-to-market objectives,” Donohue said. Natvar’s technology investment is backed by in-house engineers with expertise in developing products for stringent medical device applications. Target applications for the micro-extrusion tubing line include IV cannulas, pediatric devices, infant micro catheters, guidewires, catheter leads and any other products where small diameters and tight tolerances are necessary to achieve product objectives, said the company. Boasting a global footprint, Natvar operates five production facilities in the United States, Costa Rica, China and Belgium. Learn more about the company and its new technology in booth 1433 at the co-located PLASTEC East and MD&M East event in New York next month.